1852 letter in the Panama Star--signed "Herman Melville"? "It was a hard road to build. The tropical fevers slaughtered the laborers by wholesale. It is a popular saying, that every railroad tie from Panama to Aspinwall rests upon a corpse. It ought to be a substantial road, being so well provided with sleepers—eternal ones and otherwise." --Letter from Mark Twain in the Chicago Republican (August 23, 1868). Construction of the entire line was not completed until 1855, but an 1852 item in the London Athenaeum (August 7, 1852) references a letter about "the first trip" on a completed segment, signed "Herman Melville." According to The Athenaeum, "the author of 'Omoo" endorsed the project and expected it to be finished sooner than it actually was. Every now and then it is convenient for our readers that we should present in a few words and at one view a general idea of the progress of railway extension—this extension being one of the most powerful agents of peace, social prosperity, intellectual interchange, and civilization generally. Most important perhaps of all the iron ways now in course of construction is that at the isthmus which separates the ocean over which Columbus sailed from that which Nunez discovered. All other railways are local and provincial—this is of universal interest. A letter from Herman Melville, printed in the Panama Star, describes the first trip made on a portion of this line—that is, as far as the crossing of the river opposite San Pablo. The works, according to report, proceed without interruption; and the author of ‘Omoo’ expresses an opinion that they will be completed in about a year from this date.— --The Athenaeum, August 7, 1852. Herman Melville was then in Pittsfield, not Panama. Melville's friend Robert Tomes did go to Panama, and did write about the new railroad--but not until 1855, after its completion. "Melville could have written with some confidence about the epic construction of the Panama Railroad with its uncountable sacrifice of human life, since he could have relied on his copy of the chronicle of that achievement written by his old friend Robert Tomes...." --Melville: The Making of the Poet; also the Historical Note in Herman Melville's Published Poems (Northwestern University and The Newberry Library, 2009). "When we get to San-Francisco, I shall put this letter in the post office there, and you will get it in about 25 days afterwards. It will go in a steamer to a place called Panama, on the Isthmus of Darien (get out your map, & find it) then it will cross the Isthmus by rail road to Aspinwall or Chagres on the Gulf of Mexico; there, another steamer will take it, which steamer, after touching at Havanna in Cuba for coals, will go direct to New York; and there, it will go to the Post Office, and so, get to Pittsfield." --Melville's Correspondence, edited by Lynn Horth (Northwestern University Press and The Newberry Library, 1993), page 349. Melville himself rode the train across the Isthmus in November 1860, on his return trip from San Fransisco via Panama. 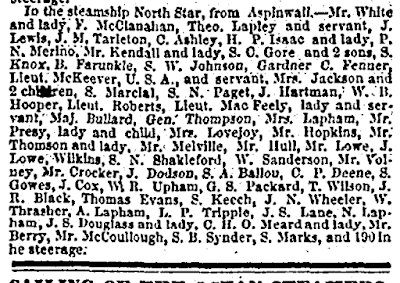 He departed from Aspinwall on the steamship North Star, arriving in New York City on November 13, 1860. 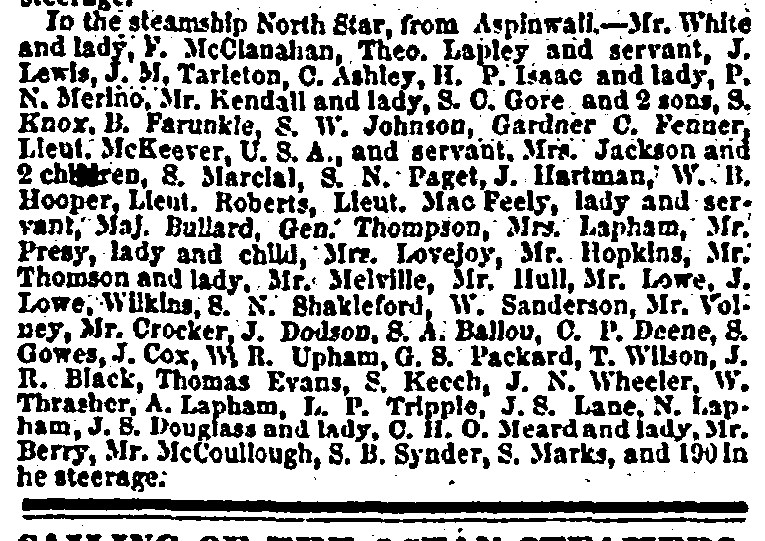 The New York Commercial Advertiser for November 14, 1860 identifies "Mr. Melville" and some of his more privileged companions including then Lieutenant Chauncey McKeever of the United States Army, traveling with his unnamed "servant"; and Lieutenant Robert MacFeely with "lady and servant." Like Melville and a number of their fellow travelers on the North Star, army officers McKeever and MacFeely had also made the trip from San Francisco to Panama aboard the Cortes. If the 1852 account in the Panama Star was first-hand, the letter-writer was presumably an admirer using "Herman Melville" as a pseudonym. I have not found the letter as printed in the Panama Star, and I don't know who wrote it, really. In July 1852 American soldiers with the 4th Infantry (including the regiment of then Quartermaster Ulysses S. Grant) rode the train as far as it went, just to the Chagres River at Barbacoas. 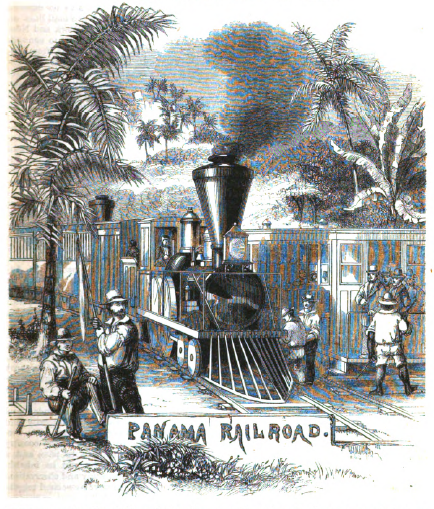 They and "300 civilian passengers" had arrived at Colón (formerly Aspinwall) on the steamship Ohio, as related by Aexander Saunders in his Short History of the Panama Railroad. Maybe "Herman Melville" was a soldier or sailor or other passenger on the Ohio. Readex, a Division of Newsbank has the Panama Star in its database of Latin American newspapers, and Wilson Library at the University of Minnesota carries Newsbank/Readex, so I drove south to the Minneapolis campus this morning and checked. Alas, complete runs of the tri-weekly newspaper (published in Panama City on Tuesdays, Thursdays, and Saturdays) for the year 1852 are only available via Readex in November and December. Nothing at all in June, July, and August 1852. 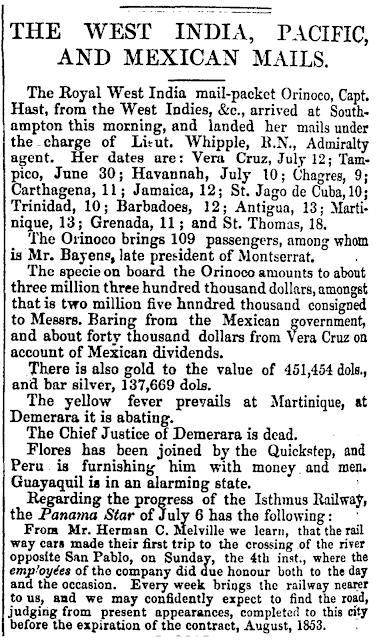 Lansingburgh Historical Society trustee and webmaster Christopher K. Philippo has discovered and kindly forwarded earlier British notices of an 1852 communication to the Panama Star from "Herman C. Melville," some of which specifically cite the Panama Star of July 6, 1852. Apparently the Athenaeum found the Panama Railroad item in a London newspaper and erroneously transformed "Herman C. Melville" into the author of Omoo. 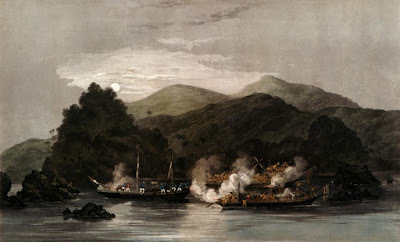 THE WEST INDIA, PACIFIC, AND MEXICAN MAILS. From Mr. Herman C. Melville we learn, that the rail way cars made their first trip to the crossing of the river opposite San Pablo, on Sunday, the 4th inst., where the employées of the company did due honour both to the day and the occasion. Every week brings the railway nearer to us, and we may confidently expect to find the road, judging from present appearances, completed to this city before the expiration of the contract, August, 1853. Reprinted in the London Daily News, August 3, 1852. Also in the Taunton Courier and Western Advertiser [Somerset, England] August 4, 1852: 4 cols 2-3; and Leicestershire Mercury [England] August 7, 1852: 2 col 1. Here's something different, though not entirely out of place, I hope, considering the number and relative popularity of Melvilliana posts on authorship questions. As my article in the current issue of Notes and Queries (September 2018) demonstrates, the consoling poem known as Do Not Stand At My Grave and Weep was originally written by Kansas native Clare Harner (1909-1977) and published under the title "Immortality" in the December 1934 issue of The Gypsy. 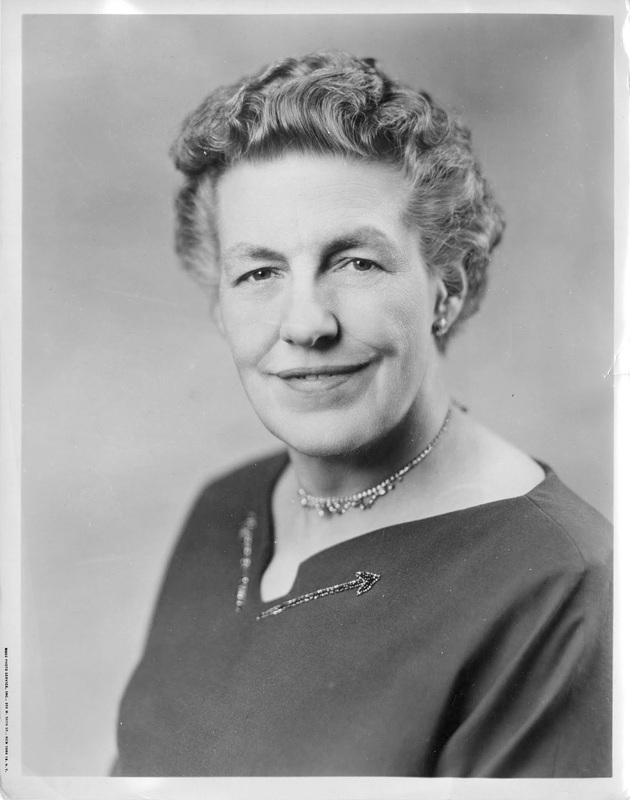 The ubiquity of attributions to Mary Elizabeth Frye (1905-2004) in print and online formats, calls to mind the persistence with which the quote "We cannot live for ourselves alone...." has been falsely attributed (by Hillary Rodham Clinton and Garrison Keillor, for example) to Herman Melville. On the internet right now, attributions of Clare Harner's "Immortality" to Mary Elizabeth Frye are sometimes accompanied by photographs wrongly supposed to represent the "Baltimore housewife and florist." Newspaper columnist Richard K. Shull first attributed the poem to "Mrs. Mary Frye" in a story for The Indianapolis News (June 9, 1983). As portrayed by Shull, however, the admirable Mrs. Frye sounds more like a copyist than composer. And the extended version presented by Shull as "her original text" is certainly not the "modern definitive version" of "Do not stand at my grave and weep" given in the London Times obituary of Mary E. Frye. Mary Frye of Dallas has long been a leader in the home decor business. As president of Home Furnishings Independents Association in 2010, Mary Frye won the Chairman's Appreciation Award. The 2010 announcement of her award was accompanied by a smart, business-style photograph that has since been misidentified as a portrait of Mary Elizabeth Frye the reputed author of "Do Not Stand At My Grave and Weep." For an updated photo see Mary Frye on LinkedIn. Another image misidentified online as Mary Elizabeth Frye of Baltimore is in fact a portrait of Mary Elizabeth Switzer (1900-1971), the distinguished government administrator and influential advocate of expanded services for persons with disabilities. I don't know why, but the bio of Mary Elizabeth Frye at Emily's Poetry Blog features an image of Margaret Thatcher.